Chicago Public Schools are faced with many challenges that have led to educational inequalities. Being America’s 3rd largest school district, Chicago serves approximately 371,000 students (Chenoweth, 2018). Of those students, 78 percent are from low-income families and 18 percent are English language learners (Chenoweth, 2018). Racial segregation in Chicago public schools remains to be an issue even 64 years after the Brown vs. Board of Education Supreme court decision to racially integrate American Public schools. Racial segregation in schools is one of the results of residential segregation that is taking place. A study done at the University of Illinois found that when asked if they were familiar with certain neighborhoods, white Chicago residents had a “blind spot” for neighborhoods that were more diverse and African-American residents were less likely to know anything about “far-flung” suburbs (Chang, 2018). 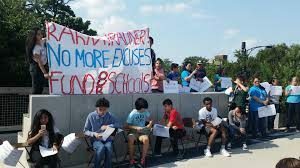 Although African-American students make up 40% of Chicago’s student population, they made up 88% of the students effected by school closures (Anderson, 2016). This is an effect of predominately black and under privileged schools being located in residentially segregated, predominately black, low-income neighborhoods. An increase in building new schools in Chicago has increased over the years and it has been found that not only does the new construction add to the districts’ debt, but also stabilizes racial and class segregation (Karp, 2016). The decision to not merge privilege schools and underprivileged schools into these new public schools, leave low-income African-American students in under-resourced schools that are located only miles away (Karp, 2016). With a racial divide impeding the quality of underprivileged schools in Chicago, achievement gaps become present. Conflict over standardize testing has been in the Chicago spotlight ever since students during the 2013-2014 school year decided to that they would refuse to take the state’s standardize test. In the 2014-2015 school year, over 44,000 students refused to take the PARCC test. Around the country people have argued that standardized testing does not adequately assess the academic abilities of a student, especially when that student is underprivileged. Of course racial inequalities among urban schools are not exclusive to Chicago. Most big urban cities face challenges regarding racial segregation and academic achievement. Studies have found that 40 percent of African-American students attend schools that are more than 90 percent minority, and that African-American students used to attend schools where 40 percent of the students would be classified as low-income, whereas today African-American students attend schools where 60 percent of the students are low-income (Rothstein, 2014). The racial and residential divide is only strengthened as middle class white families migrate from the cities and into the suburbs, taking their money and resources with them. which lead to less resources, under qualified teachers, lower graduation rates, and lower test scores. Although U.S. states vary in the amount of state funding they receive, it has been discovered that higher funding gaps are found in states that have the most urban cities (Wright, 2012).